In order to guide the work of the project a statement of purpose and guiding principles were developed. The work of the project is divided into three subcommittees. Each subcommittee follows the purpose and guiding principles as they pursue a variety of activities to promote dignity, including creating mini-documentaries, applying for research grants and developing a guide that highlights dignity promoting language. Come join the conversation, everyone welcome! Consider joining us on one of our subcommittees. The Looking After Each Other project is developing a series of mini documentaries to showcase how communities, services, systems, and other initiatives can creatively support the success of those impacted by FASD and the women who have used alcohol during pregnancy. 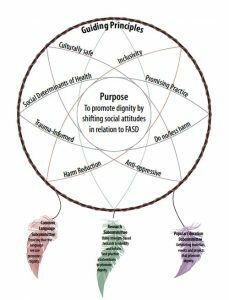 The language guide suggests dignity-promoting alternatives to common stigma-inducing words used to discuss people with FASD, women who use alcohol during pregnancy and FASD more broadly.